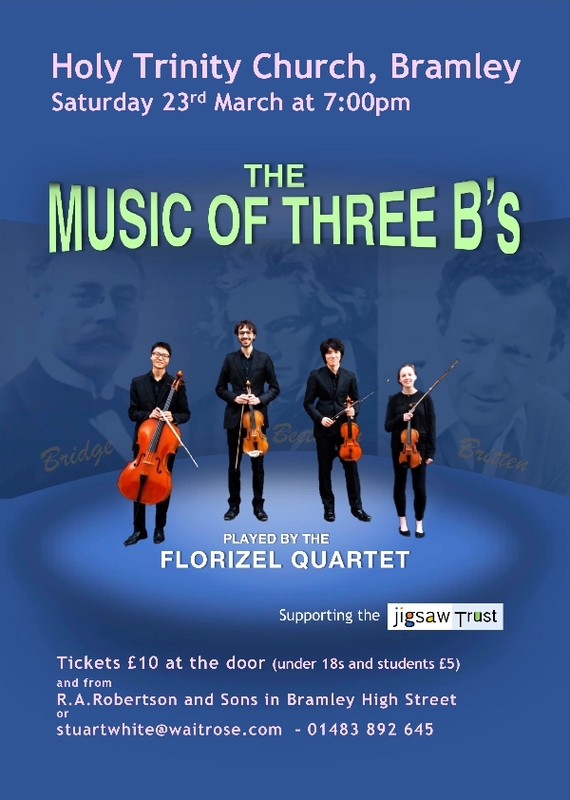 Come to Holy Trinity Church, Bramley on Saturday 23rd March at 7pm and hear Music of Three B’s played by the Florizel Quartet (https://florizelquartet.com). Young but already internationally renowned, they are an amazingly talented string quartet which they founded in 2015 at the Royal Academy of Music, and they bring us a fascinating programme of music by Bridge (Three Idylls), Britten (Three Divertimenti) and Beethoven (his String Quartet No. 8 in E minor, Op. 59 "Razumovsky", No. 2). It is particularly pleasing that their first violin, Madeleine Pickering, is a local girl. The other members come from Japan, Australia and Korea! The charity we are supporting is the Jigsaw Trust, which runs the Jigsaw School in Dunsfold for children and young people with an autism spectrum disorder. Tickets are £10 (students and under 18s £5) available in person from Robertsons in Bramley High Street; they can also be reserved via Stuart White (stuartwhite@waitrose.com or 01483 892645), and they will be available at the door. As usual there will be a free glass of wine or soft drink in the interval. 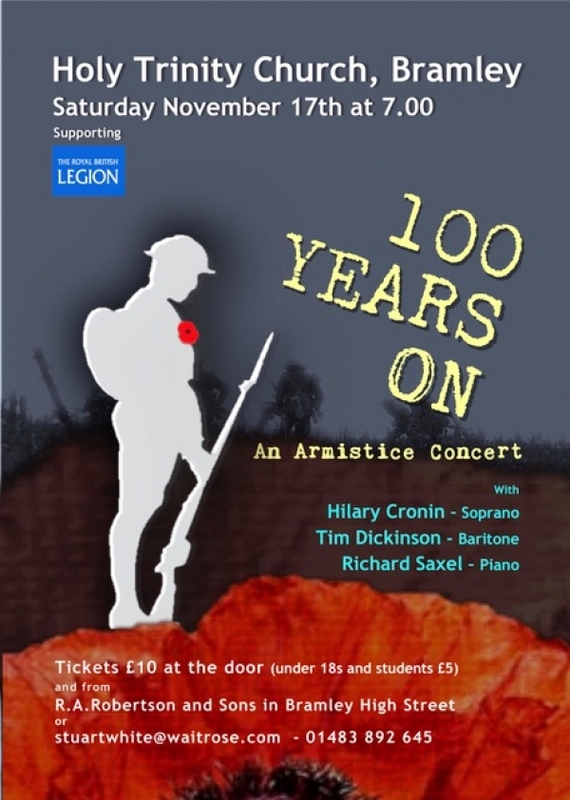 Come to Holy Trinity Church, Bramley, on Saturday 17th November at 7 pm for an Armistice Concert – 100 Years On. This very special event will mark the end of the First World War, and will be performed by Hilary Cronin (soprano), Tim Dickinson (baritone) and Richard Saxel (piano). 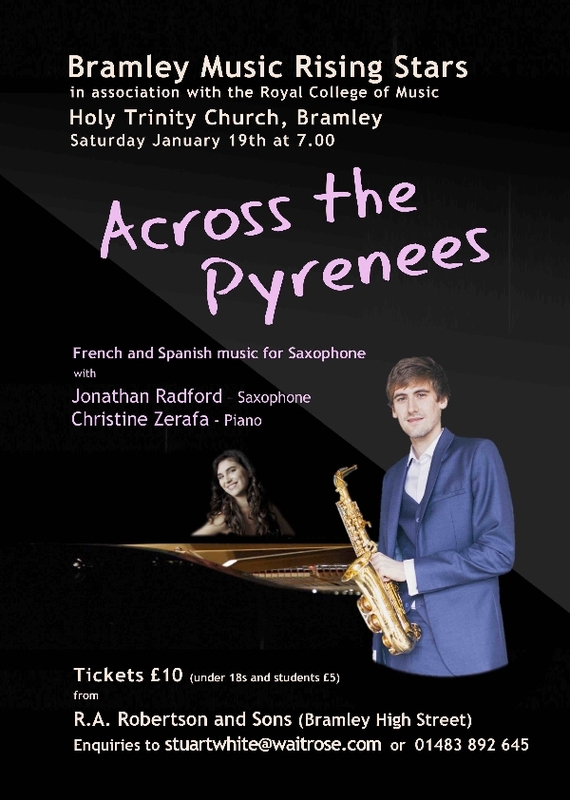 It will include songs by John Ireland, Ivor Gurney, Richard Strauss, Ernest Farrar and Michael Head, and piano solos by Frank Bridge, Maurice Ravel and Enrique Granados. All the songs were written in 1918, and the piano pieces during the war. Tickets are £10 (£5 for students and under 18s) available at the door, or in advance from Robertsons in Bramley High Street, or can be reserved via Stuart White (stuartwhite@waitrose.com / 01483 892645). There will be a free glass of wine or soft drink in the interval, and the concert is in support of The Royal British Legion. 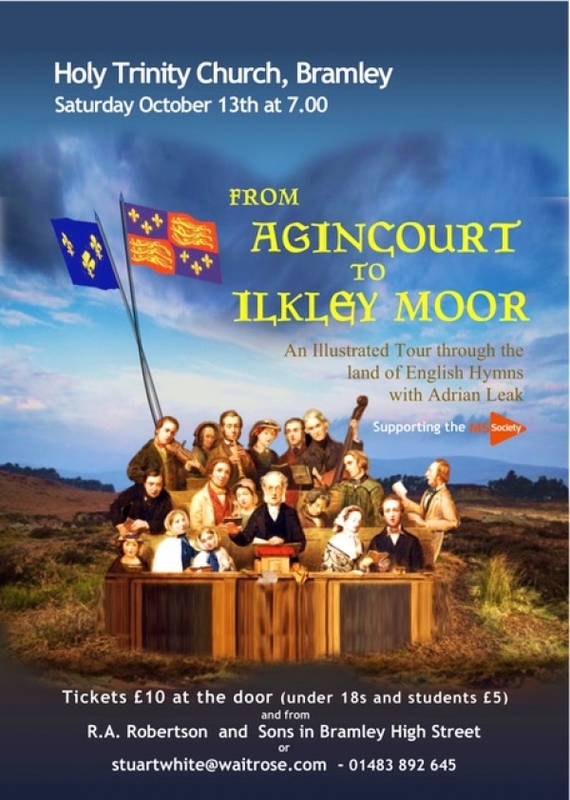 The next Bramley Music event is Agincourt to Ilkley Moor on Saturday 13th October at 7pm – when Adrian Leak (http://adrianleak.co.uk) ably assisted by his wife Josephine with the musical illustrations, will take us on another entertaining tour through the colourful world of English hymnody. The journey follows a different course from his talk Solid Joys and Lasting Treasure which he gave at Bramley in 2016, but it is sure to be equally diverting! The event is in support of the Multiple Sclerosis Society. Tickets are £10 (under 18s and students £5); they are available in person from Robertsons in Bramley High Street, and at the door, or you can reserve tickets via Stuart White by email or on 01483 892645. 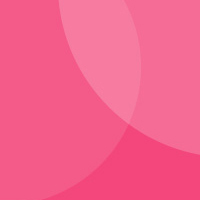 A free glass of wine or soft drink is available in the interval.